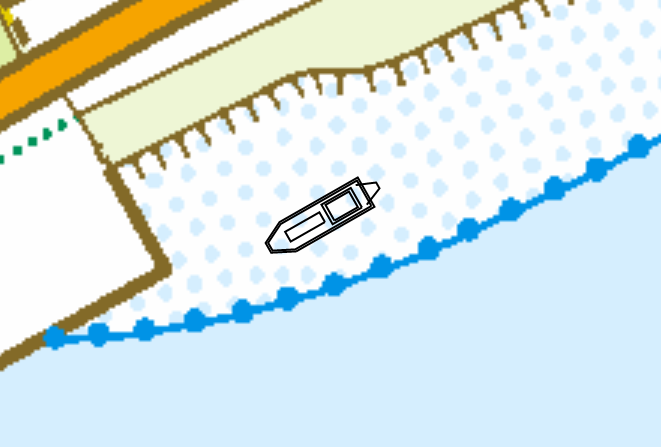 Using the built in "Vessel Editor" you can specify how the vessel should be drawn on the map. 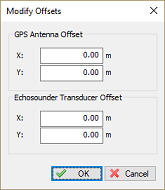 It also allows you to set the exact location of the sensors, like transducer and GPS antenna. the transducer position when the vessel's heading is known. 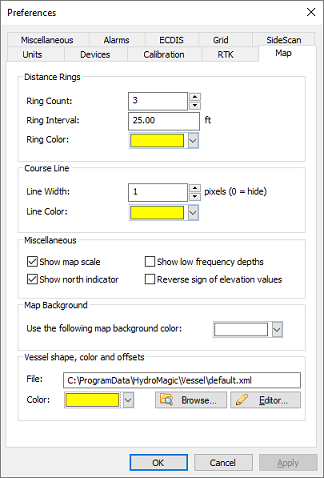 To start the "Vessel Editor" utility, open the preferences dialog by selecting "Preferences..." from the "Options" menu. The vessel editor will be started and will display the vessel as specified in the "File" field. If no vessel file has been specified yet, it opens with a blank project. Hydromagic is shipped with a couple of example vessel files. To load one of these files into the vessel editor, select the "Open Design..." option from the "File" menu. By default, all vessel designs are stored in the "C:\ProgramData\Hydromagic\Vessel" folder. To create a new design, just select "New Design" from the "File" menu. If you have unsaved data, the application will prompt you to save it now. After creating a new project, make sure you select the units for your new design first. This can be done by clicking the currently selected units in the status bar, or by selecting the "Units..." option from the "Options" menu. The best is to select the same units that are used in the drawing you have as reference. 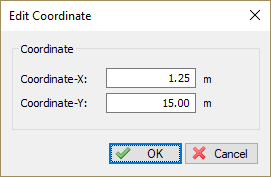 In case you forgot to select the correct units, you can always convert all coordinates by using the "Scale Features" option. To change grid options, select "Grid" from the "Options" menu. 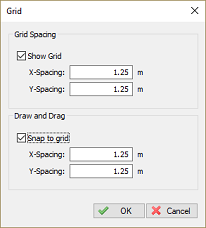 Using the grid options, you can display a grid which can be used as guidance when placing objects. 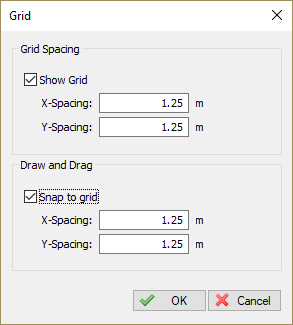 The grid can also be used to snap objects to, both options can be enabled or disabled. 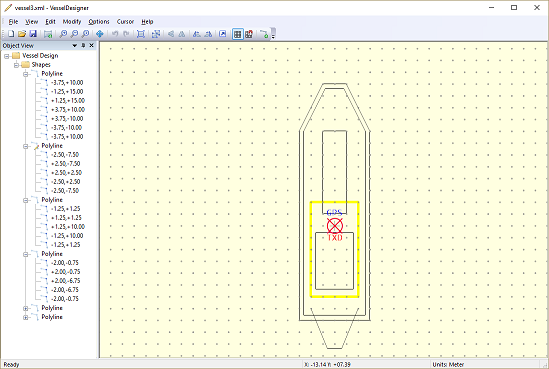 To add a line segment or polygon to the design, select "Draw Polyline" from the "Cursor" menu. To change the location of a single point, you can either drag the point around using the mouse, or alter the coordinates manually by right clicking the point, and select the "Edit Vertex..." option. Existing segments can be modified by using drag and drop. 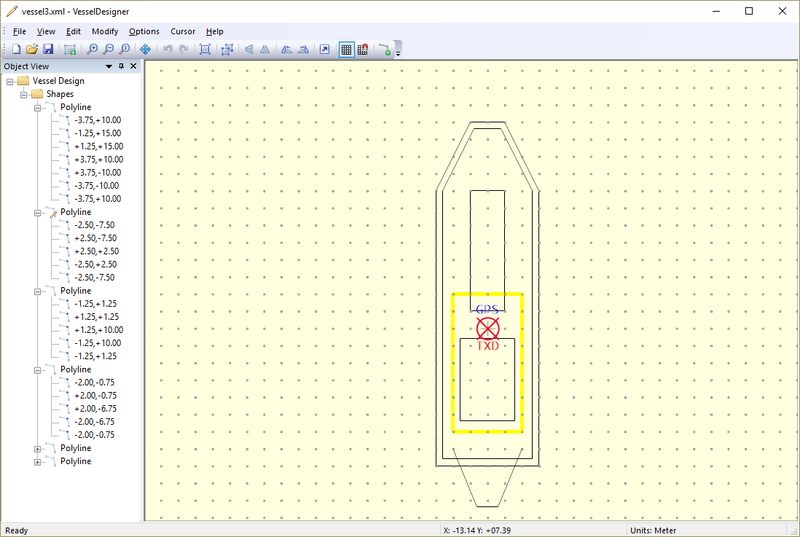 To remove features from the design, right click on the shape in the "Object View" windows, and select "Remove Polyline". To remove a single point (vertex) from a line segment or polygon, right click the point and select the "Remove Vertex..." option from the context menu. In the vessel designer, features can be moved by entering the amount of units it has to move (shift) in the given directions. To move features, click the "Move" button in the toolbar. 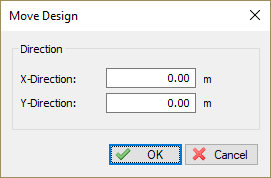 In the dialog box that appears, enter how many units the object has to move on the X and Y axes. A negative value on the X axis means the object will be moved to the left. A negative value on the Y axis means the object will be moved down. 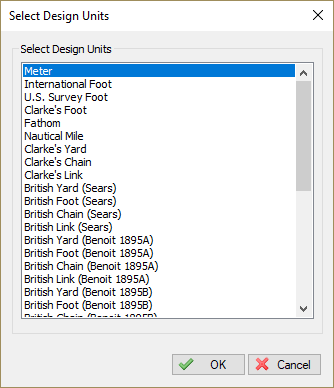 To scale the design by a specified amount, click the "Scale" button. Alternatively, you can select the "Scale" option from the "Modify" menu. In the dialog that appears, enter the scale factor. All coordinates will be multiplied with this value. Entering a value greater then 1.0 increases the size of the design. When entering a number smaller then 1.0 the size decreases. 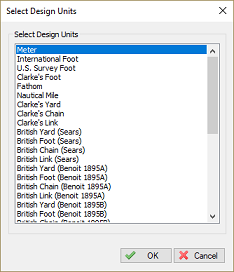 This function can also be used to convert a design from, for instance, feet to meters. In this example you would enter a scale factor of 0.3048. Objects can be mirrored horizontally or vertically by clicking one of the mirror buttons in the tool bar. Alternatively, you can select these options from the "Modify" menu. To undo a mirroring action, just perform the action again to restore the object to its current shape. 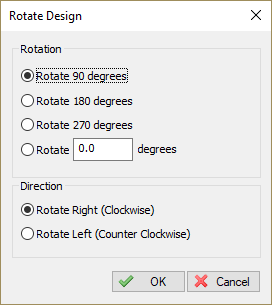 Using the rotate function you can rotate an object around its origin by any amount of degrees. Objects can be rotated clockwise or counter clockwise. 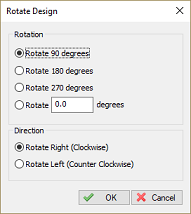 To start the rotating tool, click either the "Rotate Left" or "Rotate Right" button in the tool bar. the "GPS" circle is used to mark the location of the GPS antenna. Instead of dragging the offset positions using the mouse, you can set them manually as well. 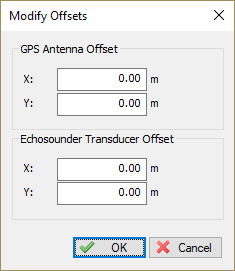 To do so, select the "Offsets" option from the "Modify" menu.